This is a pair of Prime 2.8 Pre-mounted 17mm Tires. 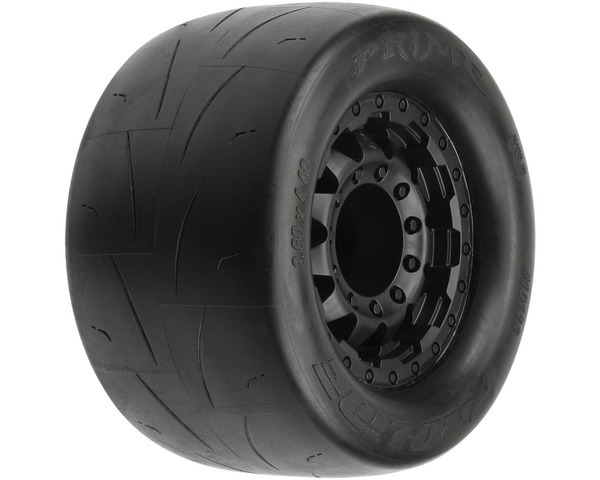 Pro-Line is very excited to announce the availability of the Prime 2.8" tire pre-mounted to the F-11 17mm Hex wheel! Pro-Lines Prime Street Tire for 2.8 Monster Truck fans has been specifically designed for High Speed fun! The Prime 2.8 is almost a complete slick tire that will put the maximum amount of rubber down on asphalt and concrete for incredible traction. The Prime 2.8 tire has a special tire carcass shape that prevents extreme tire expansion for high speed runs! The smooth sidewall of the Prime 2.8 allows for controllable slides and burnouts on the street where normal treaded tires would cause the dreaded catch and flip. Bring a whole new level of street fun to your 2.8 Monster Truck with Pro-Lines new Prime! !The Prime 2.8 comes Pre-Mounted on F-11 2.8 17mm Black Wheels for the PRO-MT 4x4 or Stampede Truck with 17mm Hex conversion. The F-11 style wheel brings the tough and rugged look of full-size trucks straight to your vehicle! The satin black finish of this super durable wheel will make your truck stand out from the rest. The wheel features a molded-in bead-loc ring and lug nuts, 11 triangulated spokes and a scale P-L logo. This 17mm hex wheel is a must have for all Pro-Line fans!